Join the Stepping Stones quilt along and learn how to make this fast and easy quilt! The Stepping Stones Quilt Along is over, but you can still join in the fun and make a Stepping Stones quilt all your own! Stepping Stones is an easy quilt, and certainly doable for a beginner. 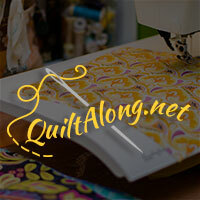 During the quilt along, the pattern to make Stepping Stones in a lap size only was offered free on my blog. If you'd like to make Stepping Stones in a different size, or if you'd like all the instructions in one easy to follow pattern, you can purchase Stepping Stones right now in my shop. Otherwise, you can use the links at the bottom of this page to jump to each week's set of steps. Instagram: Upload your photos to Instagram and use the hashtags #SteppingStonesQAL and @inquiringquilter so we can find them. If you blog, please grab a button for your blog here to let everyone know you participated! Ready to make Stepping Stones? Click the links below to catch up. Link up your finished Stepping Stones quilt! You can link up a blog or Instagram post, or upload a photo directly from your computer. Thanks for sharing your Stepping Stones quilt with us!